Find a WiFi hotspot with our WiFi hotspot locator. Our free WiFi hotspot finder will show you where free WiFi hotspot locations are instantly so you dont have to keep rebooting your laptop computer. The free WiFi Hotspot Finder just made your life on the road a lot easier. You no longer need to cross your fingers as you wait for your notebook to boot up. Just press a button and the free WiFi Hotspot Finder lets you know if your location is "hot"........instantly. No software or computer needed. What could be easier? Wouldn't it be great if you could easily find wireless internet access in your home, office, coffee shop, or vacation spot while traveling? Free WiFi Hotspots Finder is easy to use. Simply walk from room to room and push a button. That's what activates the Free WiFi Hotspots Finder. The red lights sweep back and forth. The more red lights that stay lit after the sweeping stops, the stronger the signal. For areas with a weaker than desired signal, adjust the antennas and positioning of your Access Point to optimize the signal and re-check. Free WiFi Hotspots Finder is compact and convenient. 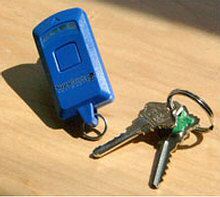 Easily attach it to a key ring, a zipper-pull on your laptop case, or wherever else you find convenient. 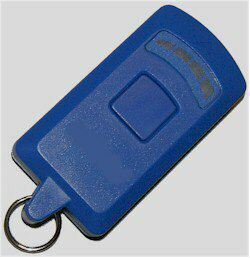 Without having to carry a computer all about the house to see if you have a good signal, the Wi-Fi Finder will determine the strength of your wireless (802.11 b/g) signal by just carrying the keychain-sized device to different rooms. What is a Wi-Fi Finder? Wi-Fi Finder is a small device useful for locating WiFi Access Points or "Hotspots" for wireless internet connections. Will Free Wi-Fi Finder help me find a good location to use my cell phone? No. Wi-Fi Finder looks for 802.11b and 802.11g WiFi Hotspots and does not search for or measure Cellular Phone Access. What is Free WiFi Finder detection range? Free WiFi Finder can detect WiFi Hotspots within 300 feet of the Wireless Access Point in a wide open area. The detection range can be less if there are obstructions between Free WiFi Finder and the Access Point(s). Why do I Need a Free Wi-Fi Finder? Free Wi-Fi Finder can help you to detect and locate a WiFi Hotspot, and it helps to find the fastest and most reliable place to connect to the internet wirelessly indicated by the strength of the WiFi signal. You can locate a Free WiFi Hotspot, before you even bother unpacking and booting up your laptop. How does Free WiFi Locator work? 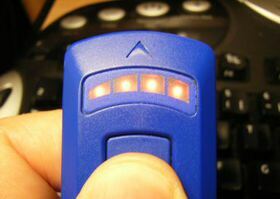 WiFi Locator scans for WiFi signals when the button is pushed and the four red lights scan back and forth. When a WiFi hotspot signal is found, the WiFi Locator picks out the Wireless Access Point, measuring and displaying its signal strength. If the WiFi signal is weak, only one red light will remain illuminated. Stronger signals will result in two, three, or four lights indicating that the Wireless Access Point is closer. The stronger and closer the WiFi signal, the more reliable and faster the wireless connection will be. A laptop should be able to communicate on a Wireless Network that registers as few as one light on WiFi Locator, assuming that you have access rights on the network. What are WiFi Seeker key benefits? WiFi Seeker is small in size and easily attaches to a key ring, a laptop bag fastener, or anywhere else that is convenient. WiFi Seeker quickly and easily detects a Wireless Network and indicates the best place to connect wirelessly to the internet. Is WiFi Locator easy to use? Yes, it is quick and easy. Just push the button and observe the red lights. The more lights that remain illuminated after WiFi Seeker finishes its scan, the stronger the WiFi signal. If the lights continue to sweep back-and-forth, WiFi Sniffer is unable to find a WiFi Hotspot in range. What does it mean when the lights scan back-and-forth? This means that WiFi Detector is searching for Access Points and hasn't yet located one. This could be because WiFi Detector has just been activated by pushing the button and has not found a Network yet. Locating an Access Point within range usually takes less than 0.5 seconds. If there are no Access Points within range, WiFi Sniffer will continue to scan while the button is depressed, searching for one. If you are using WiFi Sniffer in a location that you believe has a WiFi Access Point in range and WiFi Sniffer is not registering it, try moving WiFi Sniffer around or pointing it in a different direction as you depress the button. What does it mean when the lights stop scanning back-and-forth and some stay lit? This means that WiFi Seeker has detected a WiFi Hotspot. The number of lights that remain lit, indicate the strength of the WiFi signal. More lights indicate a stronger signal.